Competent is established to provide clients a complete range of services in developing their projects in real estate, civil engineering, infrastructure and the environmental protection sector. We act as a trusted consultancy and our competitive advantage is a delivery of integral professional services, supported by our extensive design, engineering, management and consulting skills and experience and a strong comprehension of local construction, business and a legal environment. In order to respond to complex and challenging market demands, we base our range of services and competencies on a strong partnership with various relevant local and international companies and consultants. Our project teams comprise architects, planners, engineers, project managers, lawyers and consultants with a strong background and relevant charters and certificates. The company has a world-recognized IPMA Project Management Certificate. We are also active in relevant professional associations and bodies. Through our practice, Competent constantly applies and promotes principles of sustainability. 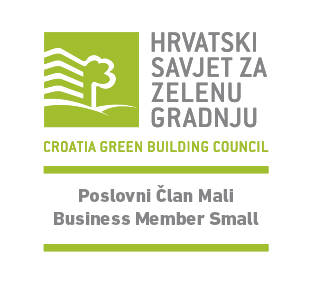 We have a world-recognized Green Building Professional certificate and we are a proud member of The Croatia Green Building Council.